Our largest facility offers four ice pads, two community halls and two meeting rooms. Skateboarders will want to head to the skatepark, located at the southern side of the property facing Guelph St. This community facility was expanded and modernized in 2013 to include the latest in environmentally sustainable building technology. Built to LEED Silver standards, sustainability was not only a priority during construction but also in everyday operation and maintenance. 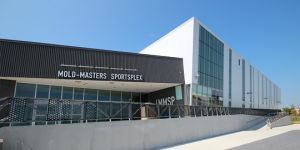 This is a comfortable, modern and inviting place for tournaments, recreational skating and shinny as well as summer events such as trade shows, lacrosse and floor hockey.